Blogger Friends Circle: Which Sites are Linking to Your Blog ? 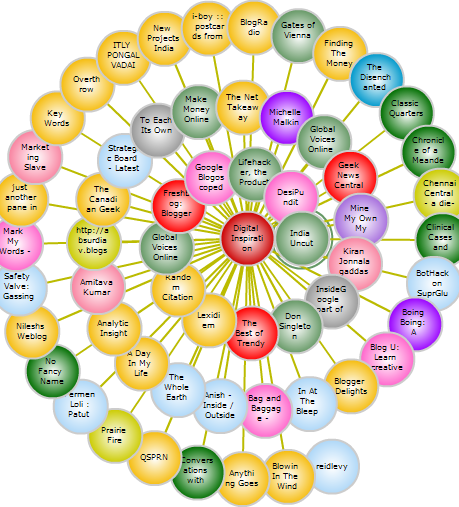 If you look at the picture above, the colored bubbles in the blogger wheel represent blogs/websites which link to Digital Inspiration most frequently. The closer a circle to the center of the spiral, the more frequently it links. The bubble colors indicate that site's ranking in the TTLB Blogosphere Ecosystem - an application which scans weblogs and generates a list of weblogs ranked by the number of incoming links they receive from other weblogs on the list.